Darren Gall, The Wandering Palate Cambodia correspondent lunches with Julie Thai, proprietor of Phnom Penh restaurant, Le Wok – an incarnation of her Khmer-Chinese and French parentage. Having lunch with Julie Thai, you come to understand that her restaurant’s ability to seamlessly combine the cultures and cuisines of France and Asia with a simple and understated elegance is an extension of the woman herself and her desire to share the things she loves. Julie was raised in Paris to a Khmer Chinese father and a French Mother; food had always been a big part of the family, with uncles and aunts owning a large Chinese restaurant in the city. Julie’s father loved to cook both French and Chinese cuisine, feeding guests and family at every available opportunity. However, he was somewhat of a purist and whilst during dinner “we always ate with a large bowl of rice next to the table and would always finish with a plate of cheese” as Julie puts it; there was never any attempt at combining the two into one dish, he did not subscribe to fusion and neither does his daughter. By her mid teens Julie knew she wanted to open her own restaurant and explore her love of fine food. “To me, eating food can be a very emotional experience”, she told me over lunch. Julie’s father dearly missed his homeland and would constantly tell her stories of life in Cambodia. Whilst Cambodia was still closed to tourists, he began taking the young family on regular trips to Asia, finally being able to bring them to visit his homeland in 2002. Julie knew instantly that she wished to remain, “One of the things I instantly fell in love with was the smells of food cooking out on the street”, she has lived here ever since, opening Le Wok in December 2007. Whilst annual trips are made to France to visit family and for ‘culinary exploration’ Cambodia is home and probably always will be. Arriving at Le Wok, on 178 street the first thing you notice is the understated yet elegant décor, a Chinese silk gown on a wall, a Khmer bust on the bar, a newspaper stand with recent copies of international papers, a wine service table; clean, sparse, tasteful in a good size room with a high ceiling. Julie tells me that many of the pieces reflect the things she likes about local and regional art and several have come to the restaurant via her house. “My aim was to create a restaurant where people feel they can come here and be comfortable, relax and enjoy their dining experience” Julie states. A double shop front combined into one large space, with the wide doors open to let the light and the view become part of the dining experience. Looking out from the restaurant you can take in the park across the road, the Royal palace and Museum Building, offering a kind of picturesque serenity amidst the swirl and din of the city around it. “I just love this street” Julie tells me and taking in the view over lunch one simply has to agree. The menu is well rounded and imaginative with half a dozen classic Asian dishes such as A-Mok, Pineapple Fried Rice, Singapore Noodles and a Cambodian Green Curry, four classic French Beef dishes, three pasta dishes, a risotto, eight European seafood dishes and for the sweet-tooth, no less than a dozen outstanding desserts. 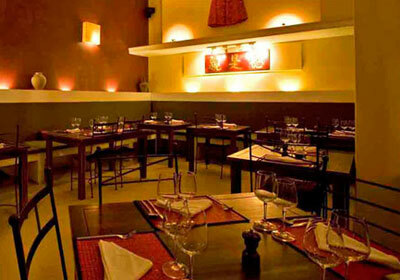 Vegetarians are also accommodated and there is a specials menu that changes weekly. The special menu is a highlight, where Julie and her team get to express their passion and creativity, scouring local markets and suppliers to, “invent interesting dishes that I want to eat and share with our regulars” says Julie. The very, very reasonable menu prices range from $6 up to $14 with most main courses between $8 to $11 dollars. For lunch I started with asparagus, poached egg and hollandaise: the asparagus delivered fresh from Dalat that morning was green and slightly crisp, just as it should be, the poached egg and hollandaise were thick and rich with judiciously used fresh Chives adding a nice foil to the sauce. For the main course, I offered Julie a chance to make a recommendation, she told me her signature dish was the Thermidor of Mekong Lobster. When pressed as to why she considered it a signature dish I was offered a hearty laugh and the comment “Because it is my favourite to eat”; by now I was almost eating out of her hand! Served in the shell with a sauce of butter, onions, white wine, mushrooms, lobster head, cream and paprika, the sweet, succulent seafood and creamy/buttery sauce was given a nice twist by the hint of paprika tempering the richness and balancing out the dish beautifully. The wine list is relatively small but well chosen and refreshingly varied, with a good selection of old and new world wines and varieties matching well with the diversity of the menu. The prices are very reasonable and calculated to suit most budgets. As it was a work day lunch, the accompaniment was a single bottle of Pierre Andre ‘Le Grand Pre’ Chablis, which seduced me with its tight, intense almost elusive flavours of green apple, pear and green fig, all wrapped up in washed rind, talc and minerals – I could easily have allowed myself to lose the afternoon in its promise of youth-about-to-blossom. Ludivine Gravoux is more than just one of the new bright shining stars in the Burgundy firmament, she is a revolutionary winemaker tilting at windmills and pushing them back from their centuries old stances. You’ll find the service at Le Wok friendly, relaxed and happy; they are also efficient and competent, adding to the enjoyment of dinning here. Le Wok is a restaurant where you can simply relax, feel comfortable and enjoy exceptionally good food at very reasonable prices. Here you don’t have to live well to eat you eat well to live and be happy. After coffee and farewells I have to dash back to work and I am already considering returning for dinner!